Let's Not Hug It Out With Our Dogs Your dog doesn't like your hugs. 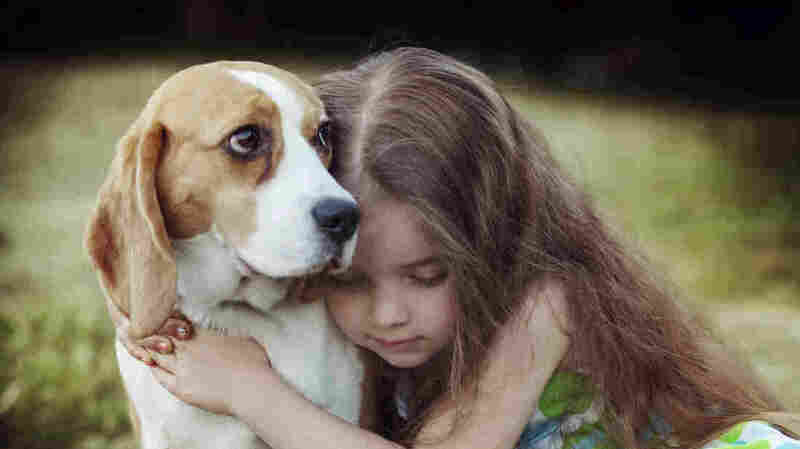 Psychologist and author Stanley Coren says that when he looked at a random sample of pictures showing people hugging dogs, most of the dogs showed signs of stress. When dogs show the whites of their eyes in a "half-moon" shape it can indicate stress. We all love our dogs. But depending on how you show that love, you may be doing more harm than good, according to one expert. Dr. Stanley Coren, a professor emeritus in psychology at the University of British Columbia, writes in a Psychology Today blog post that hugging a dog actually increases the dog's stress level. For his study, Coren looked at a random sampling of 250 pictures of people hugging dogs from Google Image Search and Flickr. "I can summarize the data quite simply by saying that the results indicated that the Internet contains many pictures of happy people hugging what appear to be unhappy dogs," Coren writes. Coren, who has written several books about dog behavior, says there are specific things dogs do to indicate stress. At the "high-end," dogs will "bare their teeth" at you. But dogs can still experience stress without lashing out. "The most common sign of anxiety is when the dog turns his head away from whatever is bothering or worrying him, sometimes also closing his eyes, at least partially," Coren writes. When a dog opens its eyes wide and you can see the whites in a "half-moon" shape, that's another sign. Other indicators of stress are when the dog's ears are low and against its head, lip licking, yawning or raising a paw. Dogs showed one of these signs of distress in 81.6 percent of the pictures he surveyed, he writes. Coren says the reason for dogs not taking kindly to human hugs goes back to their evolutionary history. "Dogs are technically cursorial animals, which is a term that indicates that they are designed for swift running," he writes. "That implies that in times of stress or threat the first line of defense that a dog uses is not his teeth, but rather his ability to run away." So when you hug the dog, it can feel trapped. And in certain cases, especially with young children, hugging can be dangerous. "All of the bite prevention programs ... say 'Don't hug the dog,' " Coren tells NPR's Scott Simon. He says data about dog bites and children show "facial bites most often occur right after the kid had been hugging the dog." "The issue is not that you shouldn't love your dog, it's just the ways that you express your affection," Coren says. "When I was a kid I had an aunt who was very fond of me, and she would run up to me every time she visited the house and pinch both of my cheeks and say, 'Oh, I love you so much!' She thought she was expressing affection and I hated it." Dog-huggers did not take kindly to Coren's pronouncement. "My dogs love being hugged," dog trainer Corey Cohen told The New York Times. Cohen told the Times the dogs in pictures Coren surveyed may have been nervous because they were being posed to take a picture. Dr. Marc Bekoff, a professor emeritus of ecology and evolutionary biology at the University of Colorado, Boulder, says it's OK to hug your dog — sometimes. "Just like people, some dogs love it, some sort of like it, and some may not like the close contact at all," Bekoff writes in a response, also on Psychology Today's website. It's important to consider factors like how well a dog knows you and how noisy the environment is. "And, if you're unsure, don't hug the dog! Better safe than sorry," he writes. According to Coren, there's a simple, non-stressing way to let your dog know you care. "It is clearly better from the dog's point of view if you express your fondness for your pet with a pat, a kind word, and maybe a treat."